← Tremendous Treasure Inside Old Sewing Machines? 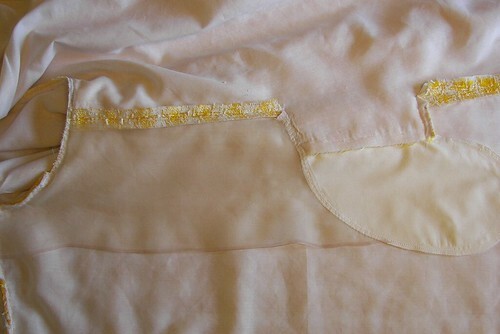 A couple of days ago Sewing Diva Els posted about making a horizontal welt pocket that does not gap when objects are put inside. Pocket (No sagging) Her tutorial shows you how to put a horizontal pleat in the pocket bag. Neat! I’ve also seen this technique in Judy Barlup’s Unique Techniques Japanese Tailoring Video and Manual (Appendices: Mitered Welt Pocket, Slick Tricks 1997). You can get the DVD or the manual or just the booklet to bone up on fabulous welt pocket techniques. I’ve used it and found it handy especially when used on a close fitted jacket. So with pocket bagging and dragging being the topic of discussion going on in The Stitchery it reminded me to think about supporting those side seam pockets in the Yellow Coat. Somewhere, probably in an old manual on Tailoring for Gentlemen, I ran across the idea of a suspension stay to hold the bag in place and decided to add an organza panel in between the interlining an the lining of the coat. Warning: the pocket placement on this coat pattern is at it’s lowest limits, probably because the pattern is a close fit and the pocket should be located in a straight part of the seam, lower than the waist and hip shaping. I laid the organza over the coat and cut along the lines marked in black, using the selvege edge on the side of the organza closest to the front. The stay is laid upon the seam allowances and zigzagged, using the multiple stitch zigzag stitch, to the yoke and armscye and again at the top of the pocket bag. I didn’t attach it to the side seam allowance since I wanted it to hang freely inside the coat and not drag at the side seams. At least that is my rationale at this moment. I have been mulling over what to use for a lining for the last couple of weeks and am determined to use only what the stash has to offer. 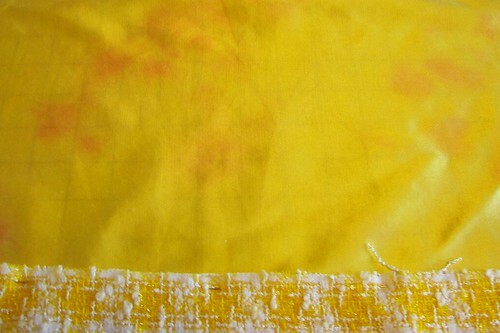 I have china silk in white (too thin), off white silk crepe and silk twill (too heavy), silk prints (too flamboyant). Nothing seemed to work but I knew I had a piece somewhere that just might work. Chemo-brained, I couldn’t remember what it looked like, though. I just knew I had something! Finally, I found it on the bottom shelf, pushed against the back of the bookcase: a 1 meter piece of 60″, heavy charmeuse, a suitable thickness for the lining without adding much extra weight to the coat. It had been a “gift”. The lady who gave it to me was starting a business, dyeing silks, and this just might have been a practice piece for her kids! It was pale yellow with pinkish splotches all over it. I’d never used Dylon before. It dissolved easily into the warm water and salt and the experience was not too tedious: I just wasn’t awake for the hour long stirring process. Hey, it went by quickly! It had to be rinsed in cold water and then washed in warm water in the machine on “hand wash”. It hung over the shower curtain rod to dry away from heat and sun. 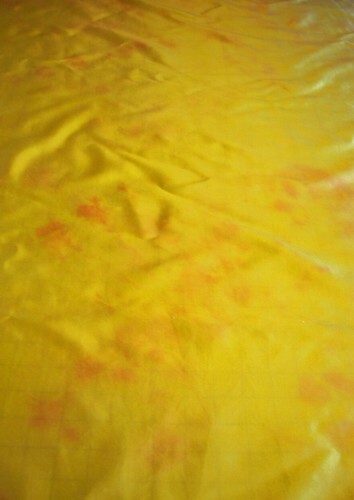 And I now have *brilliant yellow* with *peachy splotches*. It’s a nice match for the boucle and will do well in hiding the construction details of the coat’s interior. I will venture out today to find some white fabric paint and work up the courage to paint some minimalist daisy shapes to give a visual meaning (flowers in a field?) to the sunny but splotched interior of the Yellow Coat. Posted in Couture Sewing Techniques, Sewing and tagged Sewing. Bookmark the permalink. Thanks for sharing that Judy Barlup also known this way of preventing a pocket gaposis. Your way to add a pocket stay is a fine solution for any princes line or side seam pocket. I have used something similar in the past too. Sometimes we need to invent a solution our self for an occurring problem. To dye the coat lining is a great way to use up some of the stash. 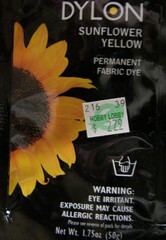 The yellow dye matches beautiful with the jacket fabric and I am looking forward to your other artistic skills like painting daisies. What a great soulution for a coat – thank you for showing this! 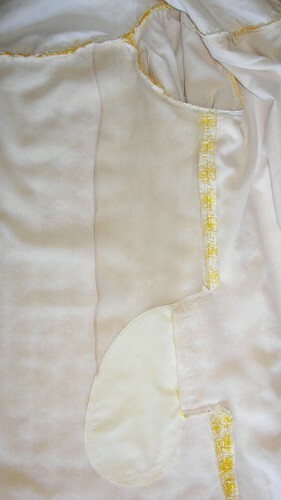 I’ve done similar stays for pleats to keep them from sagging, but never thought about making a stay for a coat pocket. The lining looks good and yes, I can see daisy shapes on it. Are you going to free hand paint them or stencil them? Thank you for this great idea..never really thought about it much, but it all makes sense. I know I will incorporate this somewhere. Love the painted or stenciled daisy idea. That will be lovely. I look forward to seeing the results. What a WONDERFUL idea! Thanks for sharing your process! I’ve used stays to keep the pocket bags from moving but usually I use some silk ribbon securing the pocket bag horizontally to the front seam; it keeps the pocket bags from shifting to the back.